David Carlaw took 5-15 for Ramsey at Saffron Walden. Ramsey and Wisbech have set up a mouth-watering top-of-the-table Cambs Division One battle next Saturday (May 30). Both won yesterday (May 23) and reigning champions Ramsey head the champions of 2013 by just two points going into the game at Cricketfield Lane. Third-placed Godmanchester are just a point further back. Ramsey celebrated a rapid victory yesterday, completing an eight-wicket success at Saffron Walden seconds in just over 40 overs. Veteran seamer Dave Carlaw claimed 5-15 and Michael Cafferkey 3-29 as the home side were shot for 82 in 29 overs and four balls. Cambs regular Cafferkey then blasted an unbeaten 47 (seven fours, two sixes) as Ramsey raced home in 10 overs and four balls. The Wisbech win took a lot longer, but they were just as convincing as they crushed Waresley at Harecroft Road by 149 runs. Aussie Tom Meyrick was the star of the Wisbech innings of 247-8, clubbing 86 from just 44 balls from the number eight batting position. Meyrick slapped seven sixes and six fours and received entertaining support at the end from Sam Rippington (34no from 27 balls). Waresley were never in the hunt in reply and were dismissed for 98. Silus Mutubaki (3-18) returned the best Wisbech bowling figures, while Paul Edgeller, Craig Johnson and Rippington picked up two wickets apiece. Nassington are fourth after enjoying the better of a high-scoring draw at Histon. Predictably Nassington’s 245-8 included a century from Dan Robinson, his third in six Division One innings. Robinson’s 105 made it 468 runs for the season, 117 more than any other top-flight batsman. Ryan Duffy (55) also scored well, but despite three wickets for James Pope and Adam Scotcher, plus two for Duffy, Histon replied with 233-8 for a share of the points. Ketton’s professional all-rounder Ajaz Akhtar left the club by mutual consent on Friday (May 22) after a disagreement with skipper and financial backer Rob Vitas, but those he left behind still eased to a seven-wicket win over Burwell seconds. Spinners Ulrich Van Duyker (4-21), Matt Milner (3-21) and Rob Woolley (2-31) did the damage as Burwell were dismissed for 124. Aussie import Ben Bryant (65no) ensured Ketton had few alarms in reaching their target. March lost what could be a key relegation contest even at this early stage of the season. The Crows went down by 13 runs at home to Warboys, the team that started the day bottom of the table having lost their first five matches. March bowled steadily to restrict their visitors to 163 and recovered from 15-3 to 134-5 to take the upper hand thanks to 49 from Ben Pyle and 32 from Ash Vodnala. But they lost their last five wickets for just 16 to complete a fifth defeat of the season and a place just three points outside the relegation zone. 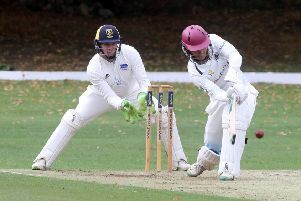 Division Two sides Newborough and Khalsa suffered batting woes. Newborough were shot out for 111 on their way to an eight-wicket reverse at Huntingdon and Khala made a paltry 81 as they lost by 10 wickets at Eaton Socon. City side Khalsa have lost three matches in a row and have slipped from top spot to eighth, just two points above the bottom two. Nassington 245-8 (D. Robinson 105, R. Duffy 55, T. Norman 28). Histon 233-8 (M. Wright 84, J. Pope 3-40, A. Scotcher 3-60, R. Duffy 2-30). Burwell 124 (U. Van Duyker 4-21, M. Milner 3-21, R. Woolley 2-29). Warboys 163 (A. Wright 3-34, J. Harradine 2-41, A. Vodnala 2-41). March 150 (B. Pyle 49, A. Vodnala 32). Ramsey 83-2 (M. Cafferkey 47no). Wisbech 247-8 (T. Meyrick 86, J. Bowers 69, S. Rippington 34no). Waresley 98 (S. Mutubaki 3-18, C. Johnson 2-8, P. Edgeller 2-13, S. Rippington 2-31). Eaton Socon 82-0 (J. Carpenter 46no, T. Banks 28no). Newborough 111 (D. Cooper 34).